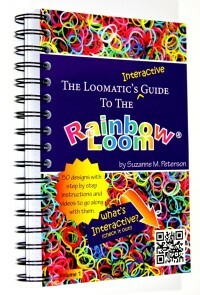 The Loomatic’s Interactive Guide to the Rainbow Loom® is a step-by-step guide to making over 50 rubber band jewelry designs using the Rainbow Loom®. The book is printed in full color with 200 pages of detailed diagrams and photos. It uses a twin-wire loop binding (similar to spiral) so that the book can lay flat while you are looming. The pages are printed on 80# paper so it can withstand heavy use. It comes individually shrink wrapped. The book is now available for order.